When designing weight training for volleyball, it is important to consider the possible training outcomes - strength, power, hypertrophy, or muscular endurance. Strength. When training for strength, the intensity of exercises is relatively high while the total number of repetitions for each exercise is fairly low. Generally, strength training consists of performing at near maximal effort with full recovery between exercises. Power. When training for power, loads are used that are slightly lighter than when training for strength to allow an athlete to complete repetitions with maximum speed. Hypertrophy. Hypertrophy (increasing muscle size) usually consists of performing exercises using moderate loads which allows for more repetitions. Rest periods are shorter because it is important to begin the next set before full recovery. Typically, the same muscle groups are worked more than usual which results in a higher overall training volume. Developing hypertrophy is not usually a high priority when weight training for volleyball. Muscular Endurance. When training for muscular endurance, intensity should be very low, while the overall volume is very high. Training should consist of lighter loads with short rest periods. Biomechanical needs. Weight training for volleyball must match the physical adaptations that are specific to volleyball. Exercises that consist of ground-based, multi-plane, multi-joint movements should be part of a volleyball players strength training. Complex movements. By considering which muscles and joints are used in volleyball, we can determine which exercises are best for our training. The major muscles used in jumping are the quads, hamstrings, glutes, and calves. These muscles work together to get you off the ground quickly and explosively. Energy system development. Not all sports rely on the same biological energy systems. When designing weight training for volleyball, we need to understand how to train our body to provide us the energy we need for our sport. Evaluate training status. An athletes training status involves their current training condition and training background. Conducting agility and strength tests can be valuable in designing weight training for volleyball. Individualization. Along with training background and history, there are many factors such as an athletes lifestyle and biological age that should be consider when designing individualized strength training programs. Multi-joint exercises. Multi-joint exercises involve two or more primary joints. Multi-joint exercises receive priority over single-joint exercises when weight training for volleyball because of their direct involvement in improving sport specific strength. Closed kinetic chain. A closed kinetic chain exercise is one in which the terminal joint meets with considerable resistance that prohibits or restrains its free motion (1). Squats and deadlifts are closed-chained and are common ways to strength train the lower body. Push-ups and pull-ups are closed-chained and are common for strengthening the upper body. Closed kinetic chain (or closed-chained) means "the distal end of the chain of joints is fixed." In the squat and deadlift, the feet are at the distal end and are resisted by the ground and restrained from moving. In the push-up, the hands are at the distal end and are resisted by the ground. In the pull-up, the bar is resisting and restraining the movement of your hands. Multi-joint exercises that are closed-chained are the most functional and should be the most important exercises in your weight training for volleyball program. Although there are many ways to arrange exercises, decisions are invariably based on how one exercise affects the quality of effort or the technique of another exercise. Here is a common ordering of exercises when weight training for volleyball. Power exercises. Power exercises should be performed first. Power exercises require the highest level of skill and concentration of all the exercises and are most affected by fatigue (2). Non-power multi-joint exercises. As with power exercises, non-power multi-joint exercises involve training your body's central nervous system. Because of the added benefit of enhancing "muscle motor learning patterns", multi-chain exercises should be performed near the beginning of a workout. Assistance exercises. Assistance exercises are considered less important to improving sports performance. These exercises are usually used in weight training for volleyball by isolating a specific muscle or group of muscles. These exercises usually consist of strengthening smaller muscle groups to prevent injuries and increase core strength. Circuit Training. Resistance training in circuits may be appropriate depending on your training goals. Decrease training time. Weight training for volleyball can be more time-efficient by alternating upper and lower body exercises in your workout. For example, after performing an upper-body exercise, you can immediately go to the following lower body exercise without having to wait for your upper body to rest. Train energy systems. Circuit training can be an effective way of developing your energy systems. Exercises can be ordered and rest periods can be manipulated to match your energy training goals. Intensity. Training load is also referred to as intensity. Intensity is the amount of weight lifted during an exercise. The heavier the load lifted, the fewer the number of repetitions that can be performed. % of 1 Rep Max. Intensity can also be described as a certain percentage of a one-repetition maximum (1RM). When do you increase the load lifted? If an athlete can perform two or more repetitions over his or her assigned repetition goal in the last set in two consecutive workouts for a certain exercise, weight should be added to that exercise for the next training session. This is known as the 2 for 2 rule (3). 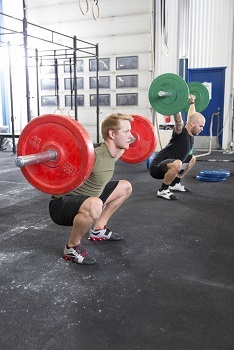 For example, lets say that a volleyball player is assigned to perform 3 sets of 8 reps of the front squat exercise. If after several workouts, the athlete is able to perform 10 reps on the 3rd set for two consecutive workouts then the load for this exercise should be increased. The training status of an athlete will affect the volume they can tolerate. Its appropriate to perform one or two sets as a beginner and add sets as they become better trained. As an athlete's weight training for volleyball progresses, sets can gradually be added to match the guidelines of the particular weight training goal. When training specifically for power, the volume is usually lower than when training for strength. This is due to using lighter loads and performing a lower number of repetitions. The length of the rest period between sets and exercise is highly dependent on the goal of training. Generally, the heavier the load lifted the longer the rest period between sets. For example, when performing exercises that train large muscle groups such as squats, deadlifts, and power cleans, you will need more rest time between sets. When performing exercises that train smaller muscle groups such as the core exercises ab curl and back extension, you will need less rest time between sets. Get the most out of training. Weight training for volleyball should incorporate the training principle of strength periodization. As with any volleyball workout program, the goal is to progress to achieve maximum results at the best possible time. Focus on one training goal. Despite a potential desire to make improvement in more than one area (strength, power, hypertrophy, or muscular endurance) an effort should be made to concentrate on only one training goal per season (or training cycle). Juniors players. With a long club season, volleyball is becoming more like a year round sport. Therefore, weight training for volleyball may consist mainly of developing and maintaining strength and power. 1) Steindler, A. Kinesiology of the Human Body Under Normal and Pathological Conditions. Springfield, IL: Charles C Thomas. 1955. 2) Fleck, S.J., and W.J. Kraemer. Designing Resistance Training Programs, 2nd ed. Champaign, IL: Human Kinetics. 1997. 3) Baechle, T.R. and B.R. Earle. Weight Training: Steps to Success, 2nd ed. Champaign, IL: Human Kinetics. 1998.